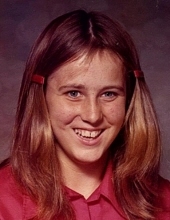 Rhonda Lou Brooks, 59, formerly of Maysville passed away Sunday April 7, 2019 in Mt. Vernon, Kentucky. Rhonda was born December 1, 1959 in Maysville to the late George Vernon “Rusty” Brooks and the late Mary Lou Hafer Linville. She was a former employee of the Kentucky Kandy Kitchen. Survivors include a sister, Diana Haydon of Nancy, Kentucky; a brother, Robert Brooks of Lexington; nieces Jessica and Leslie Haydon and Tessa Lymon; and several aunts, uncles, great-nieces and great nephews. Services for Rhonda Brooks will be at 1:00 p.m. Thursday April 11, 2019 at Brell & Son Funeral Home with Rev. Harry Brooks officiating. Burial will follow in Maysville Cemetery. Visitation will be from 11:00 a.m. to 1:00 p.m. Thursday. In lieu of flowers, memorials may be made to Rockcastle Regional Miracle Fund, c/o Angie Adams, 145 Newcomb Ave. Mt. Vernon, KY 40456. To send flowers or a remembrance gift to the family of Rhonda Lou Brooks, please visit our Tribute Store. "Email Address" would like to share the life celebration of Rhonda Lou Brooks. Click on the "link" to go to share a favorite memory or leave a condolence message for the family.